Below you will find my original Race for the Galaxy review, with only very minor editing. I’m trying to keep the feel and tone of the original post. I will, at times, insert comments or corrections, and you will find these in [square brackets]. After the original post, you can find my current thoughts on the game. 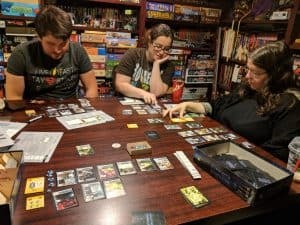 Why Revisit this Review of Race for the Galaxy? If you’ve been a follower of this blog or our podcast for any amount of time you probably already know my thoughts on Race for the Galaxy. I love this game. This past weekend we were at Breakout Con. I only brought two games with me. One was Keyforge. The other was Race for the Galaxy. 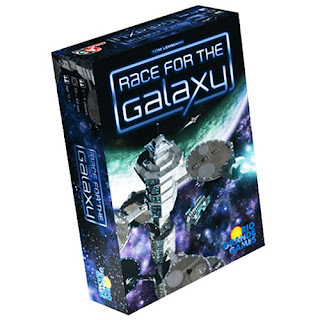 Due to the magic of Board Game Arena, I play Race for the Galaxy pretty much every day. So why resurrect this review? My main reason for bringing this old review back is curiosity. I know how I feel about Race for the Galaxy now, but I was curious to read what I thought way back then, when I had just started diving into this game. I thought it would be fun to see what I originally thought of a game that is now, ten years later, one of my all time favourites. Note: Images below are current, my initial review didn’t include any pics. 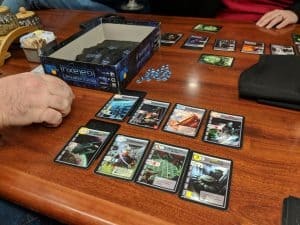 Quickly: An interesting role based card game, definitely similar to Puerto Rico, Twilight Imperium 3rd Edition (and probably San Juan). Develop – Everyone can play development cards from their hand by discarding a number of cards from their hand equal to the cost of the development. The player choosing the Develop role pays one less. Settle: Everyone can play a planet from their hand. This could require having a certain military rating or could require the discarding of cards. 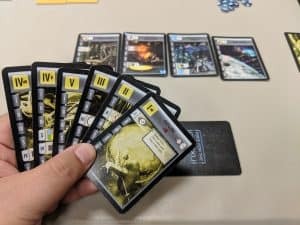 A player choosing Settle gets to draw a card if they play a planet. Consume: Use consume powers on cards (which generally results in victory points being gained). There are two consume powers, one that lets you trade a produced good for extra cards and another that nets you double victory points. Produce: Place goods on worlds. The player playing Produce also gets to put a good on a windfall world (special worlds that start with a good on them but don’t regularly replenish). These phases happen in the order listed above so, for example, you can’t produce and then consume. To make things interesting most of the cards you play on the table (developments and worlds) modify one or more of the phases. These do a wide variety of things like letting you draw or keep extra cards when exploring, making it cheaper to buy developments or worlds, giving victory points during the consume action, letting you draw cards during specific phases etc. In addition to this, each played card is worth victory points, with generally, the more expensive cards giving higher victory points. What all of this means is that players will start small building cheaper developments and settling minor worlds that will give them resources and discounts on playing later cards. By the end of the game, players are spending large amounts of resources and building/settling bigger things. The game ends when a pool of victory points are exhausted (twelve per player) or when a player places his twelfth card on the table. At this point, players total their victory points (from cards played and from tokens gained during the consume phase). The player with the most points wins. Race for the Galaxy has really nice looking cards that include some good humour as well as nice art. I really like the way role selection works in this game. The fact that a phase doesn’t happen if no one chooses it separates this game from others of its kind. It also really ups the strategy level when trying to choose a role. The way explore works by having you look at multiple cards but only select a small few is interesting as well, as you can go through the deck quickly, and actually spend rounds ‘hunting’ for that perfect card (and hoping someone else doesn’t already have it). For a role selection game this one is nice and quick and pretty simple to play and learn. You don’t need a couple of hours, like Puerto Rico, or an entire night, like Twilight Imperium. I was also very impressed by the wide variety of strategies that can be used to win at this game. In one game I tried using military might, in another, I specialized in cards that improved my card drawing and holding during the Explore phase. 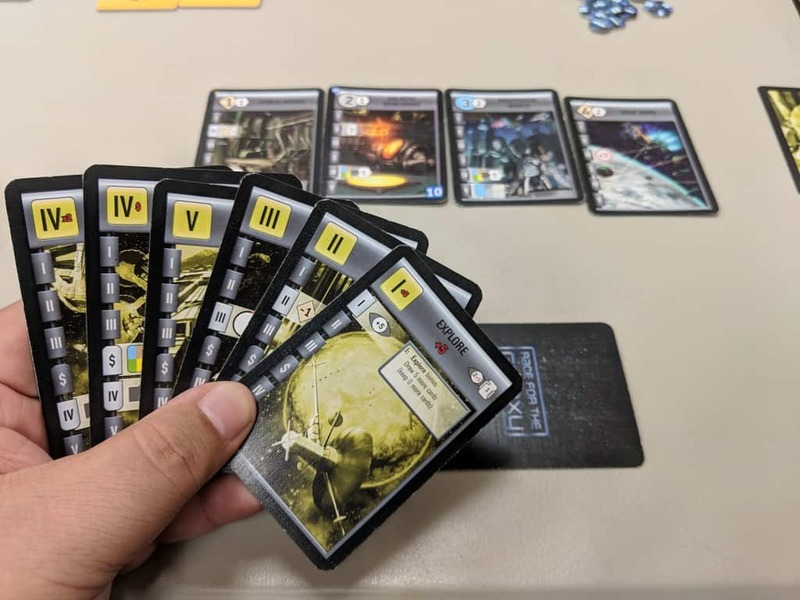 There are variable victory point cards that also give a lot of points for a wide variety of play styles and strategies [I’m talking about the six cost developments here]. The one problem with the way the explore phase works is that it gives the experienced player a significant advantage over a newcomer. This is due to the fact that an experienced player will know the cards, and will know when it’s worth searching for just the right world or development and will realize when certain cards are ‘used up’ and no longer in the deck. Now, of course, this isn’t a problem if everyone playing is equally experienced, it can actually be a benefit in this case, as the play gets much more strategic. Due to the fact victory points are tracked three ways (set on cards, variable on cards, and with tokens) it makes it very hard to see how many points each player has (which is part of the rules, that everything is open), which makes it hard to tell who is in the lead, which is very important near the end game when you are making decisions based on whether or not to play your twelfth card. I have seen some good ideas online, suggesting the use of a victory point track, this may be worth looking into as it would alleviate this problem. [This is one of the things I love about playing on Board Game Arena, it tracks everything and you can tell at a glance where everyone stands]. Instead of having a ton of text on the cards this game uses a symbol system to represent most things in the game. This is especially true for the powers each development and world gives you. There have got to be at least thirty different symbols used in the game. The first place this became an issue was reading the instructions. It was very confusing and hard to follow. The second place is during the game. There is a reference sheet as well as a list of all of the powers in the book, and we found we had to look these up constantly for our first two games. One of the worst parts is that some of the symbols are very similar and small (especially the difference between a Production World and a Windfall World. I would have definitely preferred something like most CCGs where pretty much all of the rules are there in text on the cards. This game is currently rated number ten in the world on BoardGameGeek.com [ten years later it’s still in the top fifty], and I don’t think it’s overrated. This is an excellent card game and a new and great use of the role choice system. The only real problem with the game is learning what all the symbols on the cards mean. My Current Thoughts on Race for the Galaxy and this Classic Review. Well, I have to say I’m impressed. There really isn’t much I can add to that initial review. I still think that Race for the Galaxy is the best implementation of actions selection on the market. I do find it interesting that I was comparing it to Twilight Imperium. That’s such a big epic game that I sometimes forget that the first thing you do is choose an action. It seems like a small part of a much bigger game. In Race for the Galaxy the action you select can be everything. Trying to read the other players and guess what action they will select is the key to winning in Race. At this point, I’ve played over a hundred games of Race for the Galaxy. I still love it. I’m still finding new strategies and ways to win (as well as ways to lose). What I’ve discovered over all of these plays is that it’s actually more about adapting your strategy, rather than using the same plan every game. You need to look at your starting worlds, your starting hand and read the other players and determine where they are headed in order to pick a strategy that will work with the resources you have. Then you need to be willing to change your strategy as the game goes on. If you plan on an Alien strategy but don’t draw any Alien cards, you need to adapt or you won’t be winning that game. Along with all that praise, I do still really hate all of the icons. This game is a bear to teach. Over the years I’ve met many players who simply can’t handle the learning curve. There are just too many icons to learn and many people are confused by the Consume phase and the fact there is Consume Trade or Consume x2. My complaint about an experienced player having a strong advantage over a new player also stands. This can be a problem. Now, this review only dealt with the core game. Back then, that was all that existed. Since then there have been many expansions for Race for the Galaxy, some of which are better than others. Personally, I think The Gathering Storm is a must have expansion, one that I use every time I play the game. Besides more cards and the ability to add another player, the biggest thing The Gathering Storm adds is Most and First goals. These give players direction at the start of the game, which I find really helps with early game AP (analysis paralysis) and gives players an opening strategy to focus on. Rebels vs Imperium adds more player interaction and a way to capture and/or destroy another player’s worlds. The takeover rules add another layer of complexity to the game and due to that I usually save them for playing with experienced players. Rebels vs Imperium also adds more goals and yet another player. The Brink of War is the last expansion that I recommend people pick up. This one takes what was built on in the last two expansions and adds more of it. More Rebel and Imperium Cards, more Military cards and worlds and a new Prestige mechanic. This is the expansion I keep separated from the rest of my Race for the Galaxy cards and only add in when I know I’m playing with experienced players. What it adds is great but it is completely overwhelming if you haven’t already mastered the game. Overall I can’t recommend Race for the Galaxy enough. That said, it’s not a perfect game and it’s not for everyone. I strongly suggest you find someone who loves the game and get them to teach it to you. You don’t want to try to figure out all those icons on your own. Then having been taught it, you can make your own call on whether or not this game is for you. Once you’ve got the base game I recommend getting Gathering Storm as quickly as you can and then take your time with the other expansions, only adding them after you’ve mastered your current set. Have you played this classic? What are your thoughts? Let us know in the comments. It’s funny how “symbol system” is listed as one of the ugly parts of the game. Perhaps in 2009 I would have thought the same thing, but I see this type of instructional gameplay iconography everywhere these days. I think RtfG actually taught me how to read this new and interesting language. This is something I thankful to have learned. I think it’s mainly the amount of symbols in Race for the Galaxy. I dig symbols. I dig language independent. Both good things, but there are so many symbols and sometimes there are so many symbols on one card that it can be very overwhelming.